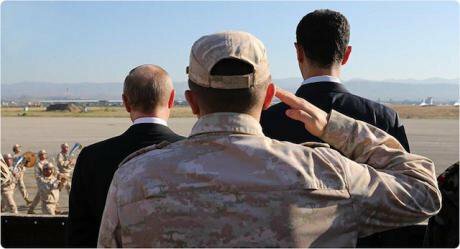 Syrian President Bashar al-Assad (R) and his Russian counterpart Vladimir Putin (L) view a military parade in the Russian-run Hmeimim Air Base in the coastal city of Latakia, Syria, on Dec. 11, 2017. Picture by Syrian Presidency/Xinhua News Agency/PA Images. All rights reserved.What is Russia doing in Syria? Is it protecting the regime of its ally Bashar al-Assad from falling? Is it protecting its own geopolitical interests alongside Iran’s in the Middle East against the United States’ hegemony? Is it really bothered by the rise of Islamists and terrorists, as Russian President Vladmir Putin claims? The Arab Spring changed the face of domestic politics and foreign policies in many countries, from Tunisia to Bahrain. However, Syria could be seen as the most catastrophic location due to the existence of major regional and international stakes, in addition to a growing ethno-sectarian conflict and the rise of transnational terrorism, which directly affects neighboring countries like Iraq and Lebanon. Endless debates can be had on Syria today, ranging from the US-Russian rivalry to the hunting of Kurdish fighters by Turkey or the Iranian paramilitary expansionism, along with sectarianism, terrorism and many more. However, one of the major conclusions this conflict brought to light is an unusual, more confident Russian participation in the Middle East – in fact, its first since the fall of the Soviet Union. Syria, like many other Arab countries, faced a wave of protests during the Arab Spring in 2011 demanding a better economy and political freedom. Within less than a year, the country witnessed the formation of an armed opposition in response to the regime’s crackdown on demonstrations. Nevertheless, the power vacuum within a new and leaderless opposition, trapped between several regional and international interests and funds, caused an early breakup, as foreign fighters from all over the world were sent to fight in Syria for very different reasons than the original demands of the demonstrators. Indeed, Shi’ite and Sunni Muslim fighters from all over the Arab world and beyond joined the frontlines of governmental and non-governmental forces in Syria. Some even joined growing terrorist organizations such as the self-proclaimed Islamic State of Iraq and al-Sham (ISIS). Facing this chaotic or complex scenario, we cannot deny that Assad’s regime would not have lasted without the support of Lebanese Hezbollah, Iran and most importantly Russia. Russian strikes began overshadowing the Syrian skies in September 2015, as requested by the Syrian government and approved by the Russian parliament. The motto “one man’s terrorist is another man’s freedom fighter”, perfectly suits the Syrian issue when it comes to the US-Russian debates about it, at least up until the Trump administration, which presented more commonalities with Putin. Today, Russia holds air and naval military bases on Syrian soil, but while the US differentiates between the terrorists and the opposition, the former seems to view both as one – and it is from here that both super powers face a tragic disagreement. The question here is about Russia’s alliance with the Syrian regime: how far would Russia risk its relations with many of the players involved in the Syrian conflict beyond this? Or is it that what happens in Syria stays in Syria? One of the most recent US-led strikes on the Syrian regime, led to Russian military casualties near Damascus and Homs in April 2018. The most significant relations at stake for Russia is the one with the US, which has proven to be notably tricky in Syria. Russia has been constantly avoiding direct engagement with the US in Syria, despite having casualties within its own military personnel amid domestic angers and concerns in Moscow by civil society and the families of the victims. If Russia does not have the confidence to directly retaliate against US attacks in a country where it has military agreements with the regime, then when will it ever? The Russian blind eye on the US involvement near its own military forces is another sign of Russian doubtful presence in Syria, and is similar to the US haphazard strikes just to boast their strength. The Soviet Union has always supported regimes opposed to Israel in the region, and now it is associating with the regional triangle’s (Syria, Hezbollah and Iran) greatest enemy – Israel. Whilst Israel continuously increases its military involvement in Syria under the proclaimed threat of Hezbollah and Iran near its borders, Moscow and Tel Aviv develop economic, military and political cooperation. In fact, the relationship between the two countries has not witnessed such prosperity in decades. The relationship reached a level where both countries even established a joint military committee, where both ensure Russia’s military armament in Syria, and in particular to Hezbollah’s locations, does not harm Israeli jets in the Syrian airspace. Despite all of this, Israeli warplanes did not hesitate to attack the Syrian regime’s T-4 air base, where Russia, alongside Iran, stationed their military warplanes and equipment. The UK and France joined the US in launching strikes last April with a strong international support from Germany, Canada, Turkey and the EU in response to what they claim was a chemical attack by the Syrian regime on the city of Douma. If we were to imagine a world where Russia is not powerful enough to face the US, is it not strong enough against the UK and France? Why would its main reaction to the European involvement in striking the Syrian-regime-held areas be to call an emergency meeting at the UN Security Council? Russia in Ukraine for instance, is more assertive than the Russia we know of in Syria. Or would an aggressive Russian retaliation against European strikes automatically entail one against the US? Russian-Turkish relations have witnessed their highest ups and downs throughout the Syrian conflict. The two strategic energy and economic partners clashed interests in the Syrian conflict: while Ankara funded and hosted Syrian opposition members, Moscow was Assad’s most prominent backer. The biggest clash occurred when Turkey shot down a Russian jet in Syria in November 2015. Turkish leader Erdogan apologized in June 2016 and the Russian sanctions which ensued after the incident were lifted – and since then, a multilateral strategic partnership developed between Russia, Turkey and Iran, where they work on finding solutions to the Syrian crisis. Nevertheless, fundamental differences in their views on Syria have ensured a continuous clash of interests even throughout the recent developments of their relationship. Moscow might have played a role in softening Ankara’s approach towards Assad’s regime, but it has not been able yet to limit their military involvements in Syria. Turkey has conducted five different military operations on Syrian soil since 2015 – justifications vary from fighting ISIS, Rojava (Syria’s Kurdish region) to the relocation of a tomb. The most recent operation is the Turkish invasion of Syria’s Afrin, where Turkey aims at driving the Kurdish YPG fighters out. YPG is the armed wing of the Syrian Kurds’ Democratic Unit Party, and they are the ideological partners of the Turkish Kurds from PKK (Kurdistan Workers’ Party). Ankara still enjoyed military and political confidence in Afrin despite the fact that pro-Russia Assad publicly criticized it and recognized it as a violation of Syria’s sovereignty. Even Moscow’s recent alignment with Syria’s Kurds by recognizing their autonomous rule in a constitution draft would not minimize the Turkish military actions in Afrin. Due to the deep complexity and the diverse contradictory involvements in the Syrian conflict, no analysis can suggest itself to be definite, including the one presented here. If there is evidence that Russia avoids retaliation with the US in Syria, then there is also evidence that it is not – and likewise with the other arguments. In today’s Syria, key players created temporary alignments with players who are arguably the enemies of the former’s own allies based on common interests on the battlefield. Therefore it would be inaccurate to consider the conflict’s structure through the lenses of the officially announced alliances. As today’s enemy, can be tomorrow’s friend, and vice versa. Finally, following this analysis – what is Russia doing in Syria if it is not reflecting its ultimate willingness to take all necessary actions to protect its ally, the Syrian regime, or even its very own interests?